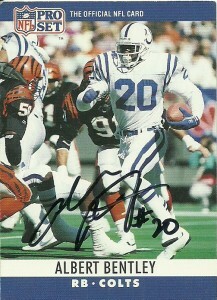 To most fans, Albert Bentley achieved fame for the Indianapolis Colts as Eric Dickerson‘s teammate during the late 1980s. In fact, early versions of the Nintendo game Tecmo Bowl featured Eric Dickerson initially as the starting runningback, as Tecmo was unaware that he was not a member of the NFLPA. In later production releases of the game, Dickerson was replaced by Bentley in the lineup with the same rushing abilities. Obviously when I played the Jack Trudeau led Colts, I relied heavily on Bentley screaming at my friends,” Here comes the Bentley!,” Referring of course to the luxury car brand by the same name. An amazing transformation from walk on to starter, Albert helped Miami win its first national championship, scoring the winning touchdown in the 1983 Orange Bowl against Nebraska. Going undrafted, Albert, (like his Miami teammate Jim Kelly,) elected to join the USFL in 1984, signing with the Michigan Panthers. The very next season the team merged with the Oakland Invaders and after injuries decimated the squad, Bentley moved to fullback. He’d champion the ground game with 1,020 yards, in an offense that featured such future NFL players as Anthony Carter and Bobby Herbert. As the USFL collapsed the NFL held a supplemental draft of USFL and CFL players. The Colts grabbed Albert’s rights in the second round with the 36th pick. 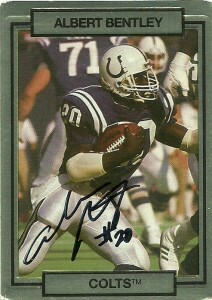 The slasher-back became a jack of all trades for the Colts, averaging well over 1,000 all-purpose yards from 1985-1990. Eric Dickerson joined the squad in 1987, and he and Eric went on to become the first pair of Colts runningbacks to each surpass 1,000 yards from scrimmage in the same season. He finished second in the league with 1,578 yards from scrimmage. 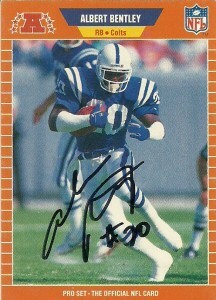 After he emerged as the Colts fulltime fullback in 1989, Bentley, Bill Brooks, and Andre Rison became the first trio of Colts to combine for 50 or more catches in a season that year. Albert checked in with 52 of them and he’d follow this up in 1990 with a career high 72. An injury riddled 1991 ended Bentley’s season just after 1 game though. He’d sign with the Steelers in 1992 but not see any significant playing time, retiring after the season. Looking back at his time with the Colts, it was obvious that Bentley was one of the toughest and finest conditioned athletes on the team. 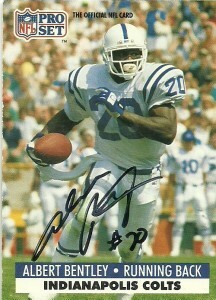 His 7,775 all-purpose yards rank 7th all time in Colts history. Versatile and difficult for linebackers to cover one on one out of the backfield, Bentley is one of seven Colts backs to amass more than 200 receptions in their career. Inducted into the Miami Hurricanes Sports Hall of Fame, Albert currently lives in Florida where he works in finance and investing. After finishing college at Central Michigan in 1983, Bentley went undrafted by the NFL and was taken by the Michigan Panthers in the USFL Territorial Draft. He’d play for the Panthers over the next two seasons, helping them win the USFL Championship, as the connection from Bobby Herbert to Anthony Carter on offense was almost unstoppable. Bentley played with the Oakland Invaders in 1985, which had merged with the Michigan Panthers, and reached the championship again, but the league folded after the season. As one of the quieter names in the league in an unglamorous position, Bentley again was not selected in the draft- this time being the 1984 NFL Supplemental Draft of USFL and CFL players. 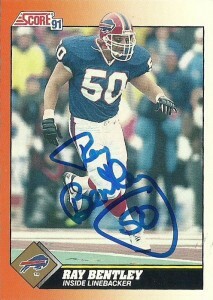 He signed a free agent contract with the Buffalo Bills in ’86. An excellent find by the Bills, Bentley worked well in the team’s 3-4 alignment, alongside starters Cornelius Bennett, Shane Conlan, and Darryl Talley, plugging right into the lineup at right inside linebacker. A menacing run stopper, Ray relayed the play calls from the coaches to the team and made adjustments at the line of scrimmage for the defense. An intimidating run stopper, Bentley was fond of using eye black and streaking it down his cheeks as though they were tears. After playing in Buffalo for 6 years, Ray finished up his career with one final season playing for the Bengals, recording his first professional touchdown on a fumble he returned 75 yards. Ray has been a very active guy since his days in the NFL ended. He’s done a series of children’s books including “Darby the Dinosaur” and has spent a lot of his time in color commentary for the Arena Football League and Bills radio broadcasts. He’s considered a member of the ‘New’ USFL advisory board, and also spends time coaching high school football. An elite, hard- working speedster allowed to wear the hallowed #1 jersey while in college at Michigan, Anthony Carter is the Wolverines all-time receptions leader and was nicknamed “AC” and “the Darter”. The Michigan Panthers of the USFL drafted Carter where he elected to play over the NFL counterpart Dolphins. With quarterback (and Autograph HoF member) Bobby Herbert at the helm, Carter had a nice rookie season with 60 receptions for 1081 yards in 1983. AC would be named to the All-USFL team as a punt returner after the season. An injury would sideline Carter in 1984 after only 6 games, but he’d rebound in 1985 with the Oakland Invaders with 70 receptions for 1323 yards and 14 touchdowns, which would earn him All USFL team honors. As a member of a USFL team, Carter’s rights were locked in by the Dolphins who drafted him back in 1983 (so he was not subject to the USFL CFL talent dispersal draft that the NFL later held). He would be traded away to the Minnesota Vikings who were still looking for a solid receiving force to replace Ahmad Rashad. 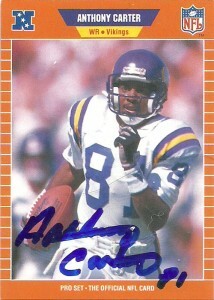 AC would fit right in with the Vikings, plus it kept him close to Michigan where he went to college and played the majority of his time in the USFL. He would be a great asset to the Vikings and would demoralize opposing defensive backs with his speed averaging 19.1 yards a reception his rookie season on 43 receptions. 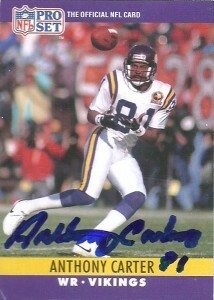 In 1987 he earned his first Pro Bowl honor with a jaw dropping 24.3 yards per catch on 38 receptions. He’d hit paydirt 7 times that season including a career long 73 yard bomb for a touchdown. 1988 would see career highs again in receptions (72) and yards (1225) for the USFL speedster. Carter would follow this up again in 1989 and 1990 going over 1000 yards both seasons. He’d also have an incredible playoff game where he burned the San Fransisco defense for 10 receptions and 227 yards. 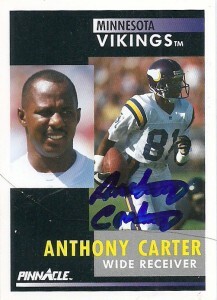 As the 1991 season approached, Cris Carter arrived in Minnesota effectively halving AC’s production, but Anthony would continue playing for the Vikings over the next 3 seasons providing the team solid veteran leadership. Anthony would be left exposed during the free agent purge of 1993 by the Vikings and signed with the Lions, however injuries and time had caught up with the former Wolverine and he’d play only 4 games with the Lions and retire in 1995. A college football hall of fame inductee, Carter has amassed a fair amount of accolades since retirement. Like many former USFL greats, one has to wonder how Carter’s legacy would figure into the football landscape if he had declared for the NFL draft or been paired up with Dan Marino in Miami. He is considered one of the 50 greatest Minnesota Vikings players of all time and was named the the USFL All Time team as first team wide receiver and second team punt returner. In 2011 he was also named the Michigan Sports Hall of Fame. After the stranglehold by Topps was loosened on the football card industry by Score and ProSet, the market was flooded with companies trying to cash in on the frenzy. Carter’s Topps cards really never did him justice, but Pro Set never failed to hit its mark. Since the implosion of the former card giant, I have gained a new found respect for how it revolutionized the industry and the 89 and 90 cards of Carter are excellent examples of this. Pinnacle was late to the party, and by that point I was sporadically collecting. They were revolutionary cards with a nice design at the time with a profile and action shot on the front. 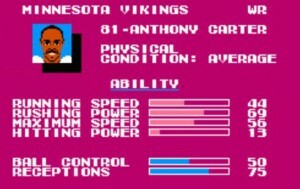 With an average team on offense, AC was about ALL the Vikin– I mean ‘Monsters’ had in the original Tecmo Bowl. I also had Carter’s Starting Lineup action figure, which was a very plain action pose that Kenner used in that mold at the time.